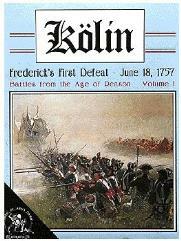 Based on our popular La Bataille system, Kolin offers the first authentic treatment of battles during the Age of Reason. Special command and movement rules reflect the inflexible and difficult nature of commanding armies of the day compared to their Napoleonic descendants. Players must master infantry, cavalry, and artillery tactics at a time when trained manpower is extremely valuable, and not mere "cannon-fodder." Kolin comes with 420 counters, three stunning 34" x 22" period maps, 2nd edition standard rules, an exclusive rules book, separate charts and tables, and an insightful historical commentary by Dr. Christopher Duffy.